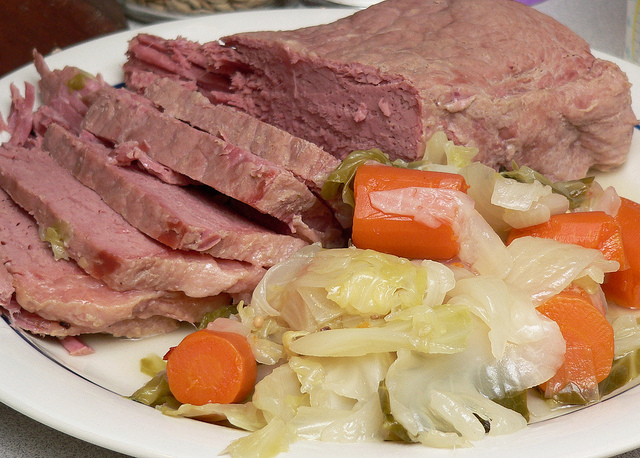 Corned Beef and Cabbage is traditional St. Patrick’s Day fare. 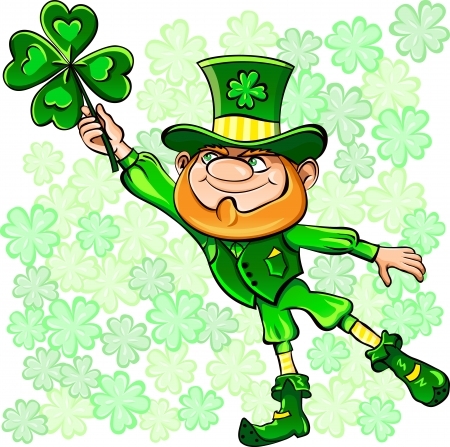 Unlike many traditional Irish favorites that contain gluten such as breaded Fish and Chips, Boxty (potato pancakes), or Irish Pasties (beef and cabbage turnovers) Corned Beef and Cabbage is an Irish favorite that can easily be made gluten-free. This easy slow cooker Corned Beef and Cabbage recipe is made extra flavorful with the addition of a dark, full-bodied gluten-free beer that marinates the corned beef as it slow cooks to fork-tender delicious mouthfuls. This recipe is so good you may want to buy extra Corned Beef to freeze so you can make it again after St. Patrick’s Day. Start out early, this dish cooks on low heat for 9 hours for tender crisp vegetables and fork-tender meat. If you are pressed for time you can prepare this dish on high heat to decrease the cooking time but you will have to watch the slow cooker so the vegetables and meat don’t get overcooked and mushy. If you don’t have a favorite full-bodied gluten-free beer try RedBridge which is a gluten-free sorghum beer that is readily available at many Walmart, BevMo, and well-stocked liquor stores. This easy slow cooker Corned Beef recipe gets extra flavor from the addition of a dark, full-bodied gluten-free beer that marinates the beef as it slow cooks to fork-tender delicious mouthfuls. 1. Peel the onions and cut them into thick crescents. Place the onion crescents flat side down in a single layer on the bottom of the slow cooker to form a base for the corned beef brisket. 2. Peel the garlic cloves. Smash each clove flat with a kitchen mallet or the flat side of a table knife. Place the smashed garlic cloves in an even layer over the onion crescents. 3. Trim excess fat from the corned beef brisket if necessary. Reserve the spice packet. Lay the brisket with its flattest side down on top of the layer of onions and garlic. 4. Sprinkle the contents of the spice packet evenly over the top of the brisket. Press the spices into the top surface of the brisket. 5. Carefully pour the gluten-free beer into the slow cooker, pouring to the side of the brisket so as not to disturb the spices coating the top of the brisket. 6. Mix the water, sugar, and apple cider vinegar in a 1-quart liquid measuring cup or medium mixing bowl. Stir until the sugar is completely dissolved into the liquid. 7. Slowly pour the water and apple cider vinegar mixture into the bottom of the slow cooker, pouring to the side of the brisket so as not to disturb the spices coating the top of the brisket. Only pour enough of the water and apple cider vinegar mixture to barely cover the brisket. Discard any unused liquid. If you have a larger slow cooker it may be necessary to add additional water to cover the brisket. 8. Add the bay leaf to the slow cooker, submerging it under the liquid. 9. Place the slow cooker on a heat-resistant surface (a raised broiler pan works well for this if your countertop is not heatproof). Cover the slow cooker with its lid. Turn on the slow cooker and program it to cook on LOW heat for 10 hours. Set your kitchen timer or program your cell phone to alert you to add the vegetables after 4 hours of cooking time. 10. Scrub the potatoes and carrots under running water and lay them on a clean kitchen towel on your countertop so that they can come to room temperature before being added to the slow cooker. 11. When 4 hours of cooking time has elapsed cut the potatoes into wedges. Trim the ends from the carrots and cut them into bite-sized pieces. Take the lid off the slow cooker and layer the potatoes in an even layer over the corned beef brisket. Layer the carrots over the potatoes. Place the lid back on the slow cooker and continue cooking on LOW heat for 3 more hours. Set your kitchen timer or program your cell phone to alert you to add the cabbage after 3 hours of cooking time. Transfer the cabbage to your countertop so that it comes to room temperature before adding it to the slow cooker. 12. After 7 hours of cooking time has elapsed (3 hours after adding the carrots and potatoes) prepare the cabbage. Remove the outer leaves of the cabbage. Cut the cabbage in half from top to bottom and carve out the tough inner core from each half of the cabbage. Discard the core material. Cut the cabbage into 1 1/2-inch thick wedges. 13. Take the lid off the slow cooker. Use a ladle to remove excess liquid if necessary so that there is enough room to add the cabbage. Leave enough liquid to cover the brisket. Layer the cabbage wedges flat side down over the carrots and potatoes. 14. Cover the slow cooker with the lid and continue cooking on LOW heat for 2 more hours until the cabbage is tender-crisp (9 hours total cooking time). Set your kitchen timer or program your cell phone to alert you that the meal is done after 2 additional hours of cooking time. 15. When the cabbage has cooked for 2 hours and the brisket has cooked for a total of 9 hours take the lid off the slow cooker. Use a slotted spoon to lift and drain the cabbage, carrots, and potatoes. Arrange the vegetable on the serving plates, leaving room for slices of the brisket. Discard the bay leaf. 16. Lift the brisket out of the slow cooker and transfer it to a non-porous (plastic) cutting board. Slice the brisket into thick slices. Arrange the slices of brisket on the serving plates next to the vegetables. 17. If desired, use the slotted spoon to lift and drain the onions and garlic from the slow cooker. Arrange the onions and garlic on the serving plates. Serve immediately while warm. 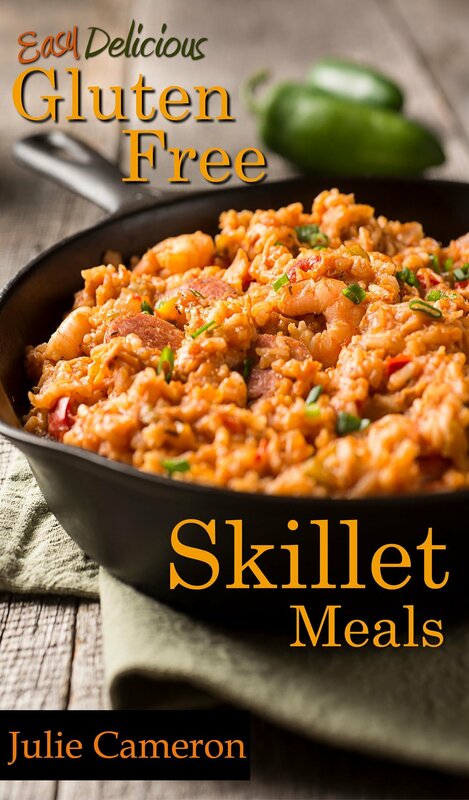 If you'd like to try more easy gluten-free recipes please purchase our cookbook Easy Delicious Gluten-Free Skillet Meals. This electronic cookbook (ebook) is readable on Kindle readers and most other electronic devices (smart phones, I-Pads, personal computers) when you download and use the free Kindle Reader App. Simply download the cookbook to your computer or mobile device and bring it into the kitchen with you to cook. Once you get used to using an electronic cookbook you'll wonder why you never thought of it before. At Easy Gluten-Free Cooking we have one mission: to help those who are sensitive to gluten learn how to eliminate gluten from their diet while still enjoying healthy, delicious meals that are easy to cook and inexpensive to prepare. Cooking gluten-free can be easy and delicious. Imagine tasty gluten-free meals on the table in about 40 minutes. Our Easy Delicious Gluten-Free cookbooks feature mouthwatering gluten-free recipes that use common, inexpensive ingredients you already have in your pantry and refrigerator. These recipes are so easy even an older child can cook them. So whether you have Celiac Disease, Gluten Intolerance, Autism, Attention Deficit Hyperactivity Disorder (ADHD), or you have found that you just feel better when you eliminate gluten from your diet you will love these easy and delicious recipes. Easy Gluten-Free Cooking is the home of Easy Delicious Gluten-Free cookbooks. Our mission is to help those who are sensitive to gluten enjoy healthy, delicious meals that are easy to cook and inexpensive to prepare. Cooking gluten-free can be quick, easy, and delicious. Imagine tasty gluten-free one-pot meals on the table in about 40 minutes. Our Easy Delicious Gluten-Free cookbooks feature mouthwatering gluten-free recipes that use common, inexpensive ingredients you already have in your pantry and refrigerator. These recipes are so easy even an older child can cook them. So whether you have, Celiac Disease, Gluten Intolerance, Autism, Attention Deficit Hyperactivity Disorder (ADHD) or you have found that you just feel better when you eliminate gluten from your diet you will love these easy and delicious recipes.